Changes to bashing, responsiveness, and a new 'Apprentice Mode'. 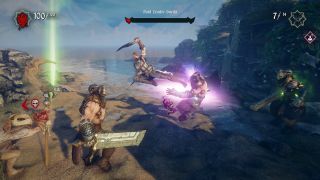 When he reviewed Hand of Fate 2 for us back in November, Eric Watson had plenty of praise for the solo card game that's also an action-RPG. He did, however, call out one aspect of it as a flaw: "Combat is unfortunately the least improved aspect of the sequel," he wrote, "despite still being a major focus of many challenges and cards." That's set to change with the latest update, which developers Defiant are calling "Combat reforged". Among its changes are improvements to responsiveness, "addressing a number of issues from sticky animation transitions to unreliable dodge vulnerability." They've also changed the way artifacts work—where before they all had a limited number of charges before they were used up for good, now some artifacts have uses-per-encounter that recharge between fights. The bash move has also been altered. Where before it was very situational, only useful against armored or shielded foes, now it can be used as a general knockback/stun. One more new feature is Apprentice Mode, as seen in the original game, which lets players more interested in playing a deck-builder than a brawler breeze through combat, as it "automates combat maneuvers like ripostes and finishers while increasing player damage output. It also stops weapon charges from resetting during combat, ensuring Apprentice players are able to access their powers more frequently in a melee." There's even more to the update than that, so check out the full patch notes.